Many people who adopt or buy an adorable little puppy, just aren’t prepared for the teething challenges that can last as long as their first 2 years. All their teeth will come in within the first year of life but young dogs find comfort in chewing on things. Left to their own devices these little guys can do a lot of damage. 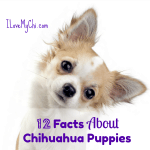 Chihuahua puppies are born without teeth with the first teeth appearing at the age of three to six weeks. There are a total of twenty-eight milk or deciduous teeth and forty-two permanent teeth. Just like with human babies, it is normal for puppies to experience discomfort when teeth are erupting. 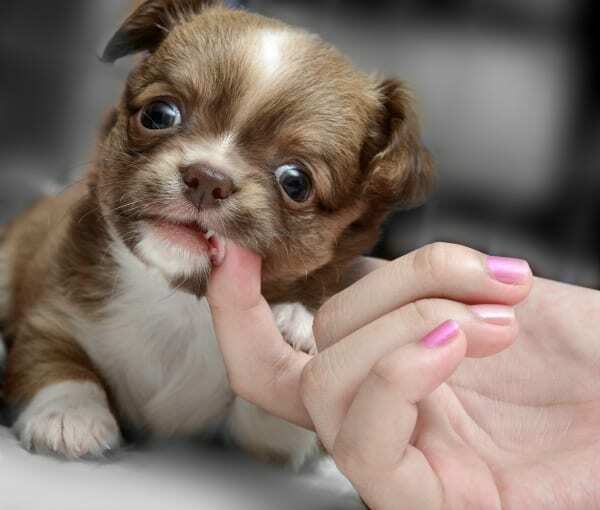 Puppies increase their biting and chewing to relieve this discomfort. Puppies will chew on people, furniture, and other objects. Dogs learn much about the world around them through how things feel, and a dog’s main means of touching and grabbing things is with its mouth. Also just like with humans, your puppy’s milk teeth will fall out. You may find baby teeth on the floor, but very often dogs swallow the teeth while they are eating. Some bleeding may occur when teeth fall out, but the amount is minuscule and owners usually notice it only if there is some mild red staining on a chew toy (The Humane Society of Missouri). • The first teeth to appear are the incisors, which erupt at about two to three weeks of age. Puppies have six incisors on the top jaw and six on the bottom jaw. • Four canine teeth (two on the bottom and two on top) appear at four weeks of age. • Premolars begin to grow at three to six weeks of age (six on the top and six on the bottom on each side). • Puppies do not have molar teeth. Puppies lose deciduous teeth between three and seven months of age. The adult tooth will absorb each milk tooth root. 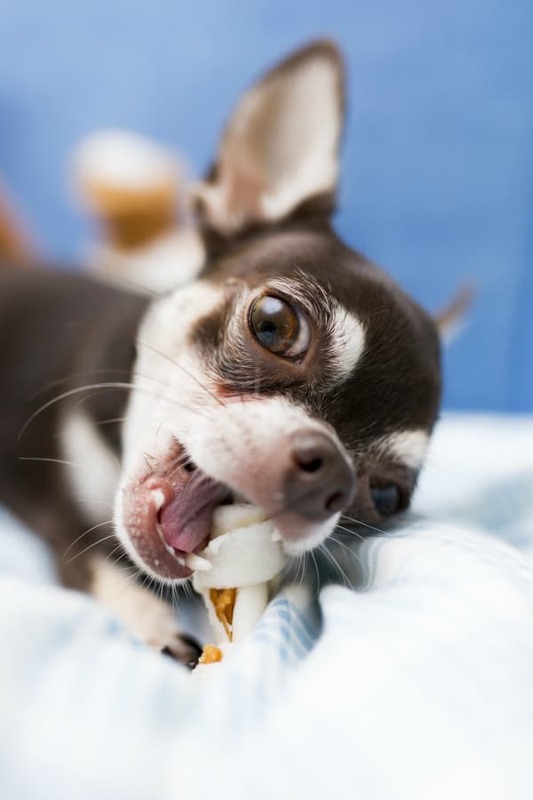 By the time your Chihuahua is eight months old, he/she should have a full set of a total of 42 teeth. • The incisors begin to fall at three months of age. • The adult pre-molars and adult canines are beginning to grow at the age of four months. • Between the ages of six and seven months, the adult molars will grow. 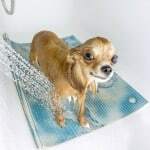 If possible, you should have your Chihuahua checked by a veterinarian when he/she is three to four months and again at the age of eight months. It is important to make sure that teeth are growing in the correct position and that there are no retained deciduous teeth. When the mouth is closed the lower canine teeth are normally situated in front of the upper canines, the upper incisors overlap the lower, the upper premolar points fit into the spaces between lower premolars, and the upper carnassial teeth overlap the lower. It is very important that teeth grow in a correct position. 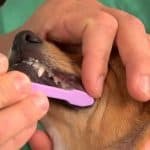 If a bad bite is occurring as a result of puppy teeth, removing the baby teeth prematurely may be necessary. The most usual site of retained deciduous teeth is the upper canine teeth but it can occur in any tooth. Retained milk teeth may cause malocclusion and it may predispose your Chihuahua to future dental problems. Food can get trapped between the deciduous teeth, the permanent teeth, and the gums, leading to periodontal disease. In general, there are few health problems related to puppy teething, however, malocclusion and periodontal disease related to retained milk teeth can be prevented with an appropriate oral examination. So now you know all the science behind puppy teething, but what about how to deal with your puppy and how do you soothe them? •First of all realize that no matter what, your puppy is going to want to chew. So provide him with plenty of chew toys so he won’t go looking for something else, like your chair or your shoe! •If you catch your puppy chewing on something inappropriate, tell them “No” or “Leave It” in a firm voice, remove the object or remove the puppy and give the puppy a toy to chew on. •Keep your puppy in a playpen, crate or a puppy safe room when you aren’t there to supervise her. And of course have a variety of toys for her to chew on. 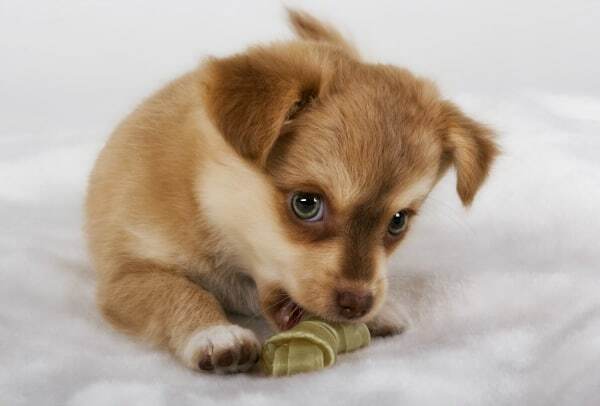 •You can encourage your puppy to chew on her chew toys by rubbing a little peanut butter on them once in awhile. Or get them a Kong and fill with cheese, peanut butter or other food. •You can give them an ice cube to play with too. I sometimes will freeze some beef or chicken broth in ice cube trays and give them to my dogs as a treat. •You can also freeze a wet washcloth and let them chew on that to relive teething pain. Just keep an eye on them with that so they don’t try to swallow it and choke. •Frozen carrots make a good teething food to gnaw on. Remember your puppy is just doing what comes naturally. Give them a break and know that this too shall pass. Most dogs love to chew on things throughout their whole life but they grow out of the phase where they have to chew on everything. 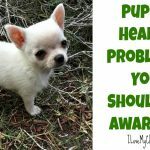 So how have you helped your teething puppy cope? I’d love to hear your ideas and strategies in the comments! Thompson , S. (2013). Pediatric Exam: Puppies. The Search for Common and Congenital Disease. SAVMA Symposium. What to do in dogs bites, especially kids? Do you mean how to keep them from biting kids Nancy or what do you do after they bite them?